The American Pilot (The Other Place, 2005) brings together an injured American Pilot and the inhabitants of an area perhaps in Afghanistan mired in conflict in order to critique the monopoly of the sky, of stories, of meaning, of images, in sum, of power, by the US and ethically confer a portion of those “qualities” to the derealised subjects of globalization. 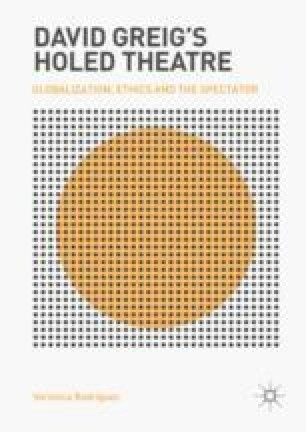 The chapter argues that the play confronts the spectator with an “animated” presence that highlights meaning and existence (undoing of entrapment), audibility (monologues) and visibility (entire cast on stage throughout). By interrogating the villagers’ entrapment (through disturbing American hegemony via a number of counterbalancing strategies) and by aesthethically undermining their state of “unreality” (through a resistant treatment of structure and actors on stage), The American Pilot cracks open the social circuit of affect and restores precariously, theatrically and momentarily the villagers to “the real”.